One of the strongest accounts pointing to the execution of a probably innocent man in recent times concerns the case of Carlos DeLuna, who was executed in Texas in 1989. 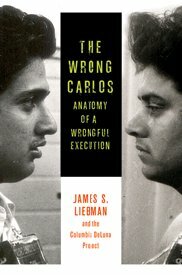 In a forthcoming book, The Wrong Carlos: Anatomy of a Wrongful Execution, Professor James Liebman of Columbia Law School describes his investigation into the case, along with a team of students. The investigation uncovered serious problems in DeLuna's case, including faulty eyewitness testimony and the police's failure to investigate another potential suspect. DeLuna maintained his innocence and said another man, Carlos Hernandez, committed the crime. Hernandez and DeLuna looked so similar that their own families mistook photos of the men for each other. Moreover, Hernandez had a history of violent crimes like the one for which DeLuna was executed. The book and its accompanying website provide evidence of a grave mistake with police and witness records, trial transcripts, photographs, and more. The Wrong Carlos will be released in July 2014 but is available for pre-order now. (J. Liebman, "The Wrong Carlos: Anatomy of a Wrongful Execution," Columbia University Press, forthcoming July 2014). See Books and Innocence.